Yamaha's GHS (Graded Hammer Standard) weighted action has heavier touch in the low end and lighter touch in the high end, just like the hammers inside an acoustic piano. 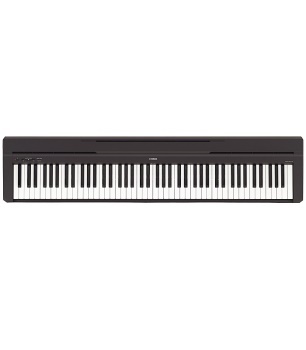 Great for the aspiring pianist, practicing on the GHS action builds the proper finger technique for when the time comes to perform on an acoustic piano. Plus the matte finish of the black keys are less slippery when playing for extended periods of time. TRIED AND TRUE, YAMAHA'S CLASSIC SOUND ENGINE FOR REALISTIC TONE: AWM (Advanced Wave Memory) sampling uses digital technology to record the sound of an acoustic piano. AWM Stereo Sampling creates a deeper, richer and more spacious sound by using pairs of waveforms (L and R) captured with two microphones. The P-45 uses AWM to play one sample per key at varying levels of volume and timbre. A COMPACT AND LIGHTWEIGHT DESIGN MAKES IT EASY TO GET AROUND: Slim and stylish form with a depth of less than 12 inches, the P-45 requires little space. At only 25 lbs. with a built-in sound system, it can be easily moved anywhere in your home or even used for performance outside. Various P-45 settings can be changed with a single button. Hold down the "GRAND PIANO/FUNCTION" button and press the keyboard to change Voices, play demo sources, configure the metronome.